Are you interested in paying by installments? HORES is a proven system for hotel management. It comprehensively addresses the problems of the accommodation section, front desk and other processes at the hotel. HORES allows you to manage your operation quickly and easily, so you'll be able to concentrate more on your guests. Join more than 500 other hotels and allow us to convince you. Bookings directly from the hotel website, simply and without commissions. 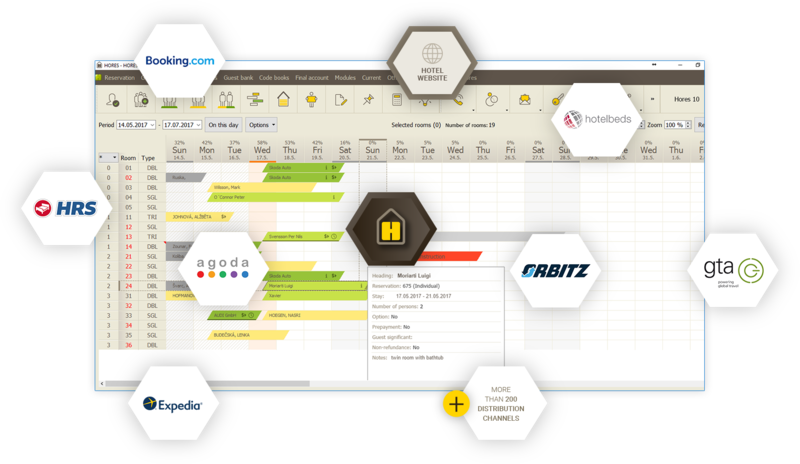 Operating all your booking channels from one place. You will see all bookings, modifications and cancellations immediately in your HORES. We are very satisfied with HORES Property magement system. It helps us to optimize everyday processes, therefore Front Office can focus on the most important – our hotel guests. HORES is a complex, efficient and user friendly hotel tool and together with a great customer service fully satisfies four-star hotel requirements. We highly appreciate such „win-win” cooperation and recommend it for other hoteliers. V našich hotelech Le- Hotels Group (celkem 864 pokojů) používáme hotelový systém Hores 10 s propojením do systému pro správu kanálů TravelClick. Nejdříve jsme HORES začali používat v hotelu Yasmin, poté jsme přepojili i Hotel Grandior (393 pokojů). Další hotely budou následovat v lednu a v únoru. Oceňuji hlavně platformu na distribuci cen a kapacit, která byla přizpůsobena našim potřebám a požadavkům a značně zrychlila práci Revenue oddělení. Zvýšila nám vytíženost a ADR hotelů vzhledem k možnosti rychle reagovat díky automatickému doručování rezervací a automatickému zvyšování/snižování cen dle obsazenosti. We can't speak highly enough about HORES. After trying various hotel programs, we can say that HORES is truly unbeatable. Besides, their customer support and communication is just perfect! So we can only recommend HORES! The HORES hotel software is the best option for our small sanatorium that we chose from all the competing programs offered. We are very satisfied with your training staff, as your software is easy to understand only after a short training for our new front office staff. Within 3 to 5 days, our new front office staff are able to work on their own. The HORES hotel program surely was the right choice for us since it meets all our requirements for a functional hotel program. The program suits all our employees in the accommodation sector and we would evaluate it as truly "user friendly". We started to use the HORES hotel software in December 2010 after a break. It is a system that fully complies with all the requirement for modern hotel management. 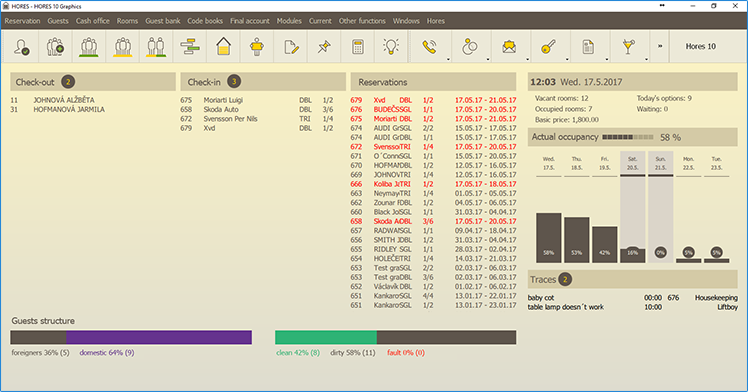 HORES is also very easily managable for users and it provides enough space for the front office staff to focus on the guest and not a computer as is very often the case nowadays. We are very happy with the HORES customer support and any problem is promptly resolved with helpful advice or a specific action. We are thankful to HORES for such high-quality cooperation. HORES is a quite simple and user friendly hotel program. The program is complex, with a fairly good graphic design. I have been using the HORES hotel program for five years and I can highly recommend it to all who consider buying hotel software or replacing their existing software. I appreciate mainly the HORES friendly user interface and connectivity with other programs. An indispensable fact is also a professional approach and quick service from all Hores employees. HORES is a complex hotel software created by a company familiar with hotel issues. In my opinion, due to the many years of experience with various programs, HORES has absolutely no competition. I don't know a program on the Czech market which could be used after such short training without any problems. If a technical problem happens to occur, it is immediately removed by HORES. In the case of new requirements to supplement or modify the program, everything is resolved in the shortest possible time. They provide excellent service at unbeatable prices. We are pleased with the HORES hotel program as it simplifies, streamlines and accelerates the records of reservations, guests, guest accounts, and daily reports. The HORES staff always willingly and quickly solve any problem.